Pat McDonagh of Supermac’s with Michael Larkin and Pat Kearney, Galway County Board chairman. Photo - Mike Shaughnessy. 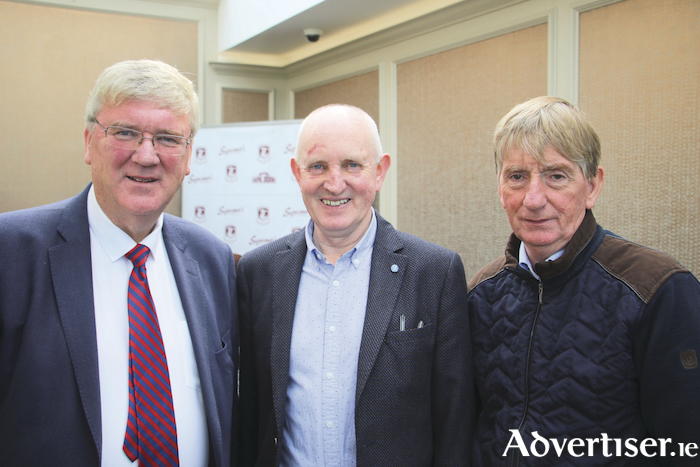 There have been many changes to the way of life in County Galway over the past three decades but one constant that has remained is the steadfast, loyal, support of Pat McDonagh and Supermac's to the promotion and development of Gaelic games in the county. The CEO of the family fast food restaurant sat down with the Galway Advertiser to chat about Supermac's long standing relationship with Galway GAA, the similarities between a successful sports team and a successful business, and of course, the big game. "Any time a county wins an All-Ireland and especially when you are from the west you have earned it," smiles Pat McDonagh. The CEO of Supermac's has seen and experienced all the highs and lows with Galway's intercounty teams over the years. The business has been involved with Galway GAA for 28 years making it one of the longest running sponsorship relationships in Irish sport. "Supermac's has had a long involvement [with Galway GAA]. Ourselves and the late Pat O'Grady would have been involved with the teams before shirt sponsors became official. Pat and ourselves would have contributed to the training fund at a time when there were no sponsor names on jerseys. When it was ratified by the GAA, we proudly stepped forward as the shirt sponsor and we have been there ever since. "There has been a long relationship between ourselves and Galway GAA and we have experienced the highs and the lows out there on the field with the team, but when the team finally reaches the Holy Grail like they did last year, it is certainly worth it and you forget about the close calls and disappointments. For Mr McDonagh very little can compare to the excitement generated by one of Galway's intercounty teams reaching the final. "It gives the county an energy and a strength when you have been waiting for something for so long and when you finally get it. After the final last year, it was more a sense of relief. But to see the effect it had on a lot of people, and indeed younger people where children picked up the hurl and visualising themselves as one of the players and going out to hit the ball. It was really brilliant." The current squad are looking to emulate the heroes of 87 and 88 by winning back-to-back Liam MacCarthys. Many things have changed from transport to technology and even the game itself but Mr McDonagh says the euphoria of the win is still as exhilarating. "The difference between now and between back in the eighties is you are in a different world. A lot of those people who are attending now were not even born back then. Of course media and communications and travel has changed. Even going to the match, you would have had to go the night before otherwise you could be caught like there were last Sunday, in queues for hours. "But the after effect when you win an All-Ireland is very much the same. The euphoria, the pride, the sense of achievement, and good humour everyone in the county is in after it. There is such a difference. Many times we have been there and you feel depleted after a defeat. There is such a contrast between winning and losing. People will be out there and spending money which is a great knock on effect for the county." The season of 2018 could turn out to be most successful ever for Galway GAA as the senior teams and minor teams in both mens and ladies, all sponsored by Supermac's, chase All-Ireland glory. Mr McDonagh believes that the success is down to the hard work and talent that is at the county's disposal as well as the major boost in confidence derived from the winning of the All-Ireland last year. "We are in a unique position this year where all teams have gone deep into the Championship. That is the advantage of a team winning an All-Ireland. It gives a certain impetus to achieve the same thing, if they can do it, we can do it. It creates a self-belief. It creates confidence. It creates hunger. It creates willpower. All those combined can be very potent for any team. "I have always thought all Galway teams whether football, hurling, camogie, or Ladies' football have the talent and ability and the players and sometimes it is just marrying all the ingredients together to strive for one goal. Unfortunately it might not happen, but to win an All-Ireland you have to have everyone aiming for the same objective." According to Mr McDonagh success on the sporting field and success in the business world are closely related. He points to preparation, team work, adapting to change, and recognising weaknesses as crucial if a business or sports team wishes to fulfil its potential. "You are learning the whole time in any business or sport, team or individual, as a person. You should strive to improve yourself the whole time and there is constant room for improvement. You can never say you know enough about anything, to say that you are the finished article because business and sport is constantly changing. You have to adapt to those changes, learn to deal with those changes, and learn to be a part of the change sometimes. When you learn from change, it can give you an advantage in business or sport. A couple of per cent and fine margins can make a difference. "I have learned a lot from how teams are managed and how they are motivated for business. There is a core relation. In hurling it is for 70 minutes but the preparation work that goes into that is tremendous. It is the same in business. The preparation work that goes behind the scenes can give you that advantage. On the day, it is down to the staff and management of Supermac's as well as the backroom team and marketing team to work together to achieve a specific goal. It is all about aiming for the one direction. Sometimes it is challenging to unite all those forces. Likewise in sport, you have a host of personalities and positions, and it is the management's job to combine those together to get them working together as a team. "It is also about recognising your weakness. Every team and business has a weakness, but recognising and acknowledging that you must improve in a certain area is what makes for a successful outcome. Not everything will go right on the day but it is about dealing with those situations to achieve the best outcome. It is important to use the talents at your disposal to outweigh your weaknesses." Mr McDonagh also stressed the need for humility and keeping feet on the ground in order for any business or team to achieve its goals. "There is no room for egos in teams or business because egos destroy teams. Egos destroy businesses or any organisation. Once an ego takes over you can forget about success. That is what is brilliant about the Galway team and management. There are no egos. They are well grounded, and consequently they are where they are and that is an All-Ireland final." Turning attention to Sunday's big game, Mr McDonagh believes Galway will edge it and bring Liam back across the Shannon for the second consecutive year. "It is probably slightly different this year to last year because many around the country would have wanted Galway to win due to the length of time since a team brought the Liam MacCarthy back west. Whereas this year a lot of people around the country will want to see Limerick because they have not won an All-Ireland in nearly 50 years. That is what makes it more challenging but more entertaining and satisfying for Galway fans. "It will be a tough game. There will be plenty of excitement and tension. I think the experience of Galway will make the slight difference but it will be tight like most of the games have been up to now and of course that little bit of luck as well."